Well today I took possession of my Crafterscompanion blockbuster which I got from create and craft. 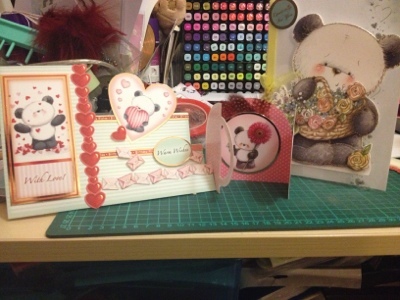 The stepper card I have done was copied from the inspiration sheet. The little one I added some red feathers. And lastly I used silver foiled love hearts acetate. Inside I used white pearlised paper. I added a yellow ribbon. The topper I put on using the best glue in the world collall. The decoupaged bamboo. And I added light green and yellow gems at the top. I so love bamboo.